New York Times bestselling author Jude Deveraux will capture your heart with signature classic novel, a time-travel romance featuring a present-day heroine and a dashing hero from the sixteenth century! Abandoned by a cruel fate, lovely Dougless Montgomery lies weeping upon a cold tombstone in an English church. Suddenly, the most extraordinary man appears. It is Nicholas Stafford, Earl of Thornwyck…and according to his tombstone he died in 1564. Drawn to his side by a bond so sudden and compelling it overshadows reason, Dougless knows that Nicholas is nothing less than a miracle: a man who does not seek to change her, who finds her perfect, fascinating, just as she is. What Dougless never imagined was how strong the chains are that tie them to the past…or the grand adventure that lay before them. 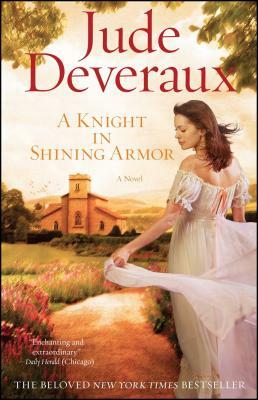 Hailed worldwide as one of the most romantic novels of all time, A Knight in Shining Armor is “a glorious love story that spans centuries, worlds, and souls. It is the epitome of every woman’s fantasy” (Chicago Daily Herald). Jude Deveraux is the author of more than forty New York Times bestsellers, including Moonlight in the Morning, The Scent of Jasmine, Scarlet Nights, Days of Gold, Lavender Morning, Return to Summerhouse, and Secrets. To date, there are more than sixty million copies of her books in print worldwide. To learn more, visit JudeDeveraux.com. Romantic Times Rare and simply delightful...poignant, sensual....This unique story will capture your heart, make you laugh, cry, and wish this could come true. The Washington Post A well-plotted book with a very attractive hero and a lot of charm. Chicago Daily Herald A glorious love story that spans centuries, worlds, and souls....A Knight In Shining Armor will capture your heart -- and hold it.